Variations: The PSS-460 and PSS-470 are identical except for the color scheme. Stereo RCA outputs – It is super handy to be able to plug the RCA outputs directly into my computer for multi-track recording, plus the built-in speakers continue to play. So that makes it easy to hear what I’m doing without setting up some kind of external speakers. Sustain Mode – While a sustain pedal would be preferable, most keyboards in this genre don’t have any sustain mode at all. So having this button allows me to create a fuller sound on some of the instruments and also can even give a sensation of reverb in some cases. Manual Drums – It may only have 5 drum sounds, but at least you can play them manually, which is great for recording multi-track music. Many keyboards from this era can’t do that. 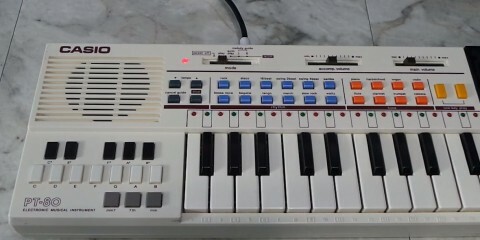 Synthesizer Controls – It may only have 21 instruments, but the synthesizer controls allow hundreds of new sounds to be created. Your imagination is the only limit! A little note about the Stereo Symphonic control. The YM3812 chip only outputs mono sound. So they are using some sort of trick to essentially wobble the sound back and forth between the left and right speaker. So it isn’t a true stereo. Just be sure that if you are recording from the keyboard using mono tracks, that you remember to disable the stereo symphonic because it makes everything sound really odd. This keyboard has 49 keys, but sometimes it is still tough to get a deep bass sound. It has no ability to transpose to a lower octave, however thanks to the synthesizer, if you turn the “spectrum” control all the way to the bottom, it will create some very deep bass sounds for you! A note about the synthesizer controls. While there is a button to turn on and off the synthesizer, you can actually use those controls to modify any of the built in instruments. In fact, the controls don’t give you full control over all of the features of the chip, so sometimes the only way to get a certain sound is to start off with a built-in preset and then modify it.